So I already told you about the party we had for my hubby's fantasy football draft party. It was a party we threw together on really short notice and on a tight budget. You can read all about those details here. 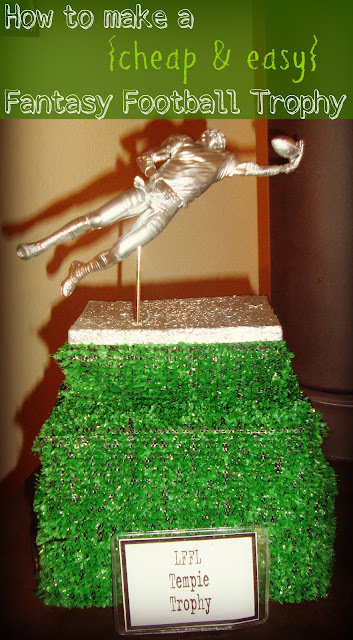 One of our favorite parts of the whole party were the trophies. Yes trophies. I never thought we would make trophies but we did. We made them for fun. My man and his friends love trash talking each other about their teams and who will win and so on and so on. Can't you just hear Queen's song "We are the champions" in your head? Oh yeah I totally just sang some Queen while I was typing this post. Ok anyways back to the trophy. Pretty sweet right? I know it's not some fancy-smancy trophy but for doing it in ONE day and using what we had to make it, I thought it turned out pretty cool. For the details on making it. The base is so easy. I made us a big block of wood by screwing little cut off pieces of a 2x4 together. Then we covered it with some of the astro turf rug that I used for the table cover. We then took one of my husband's old toy football dolls action figures. And I spray painted that baby chrome. I wish I would have taken a before picture of the toy first. 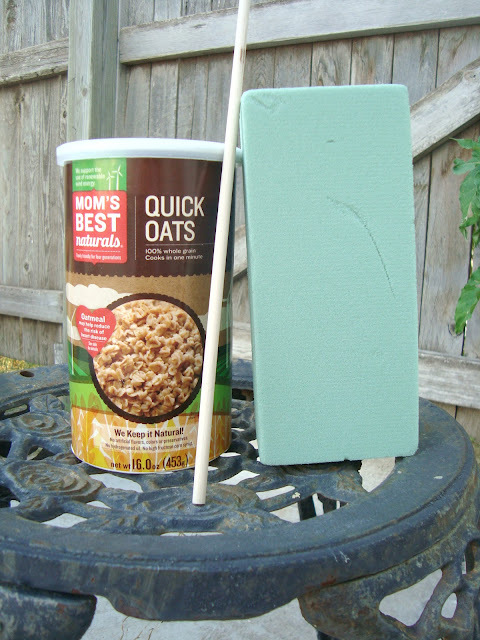 But here is the paint and primer I used. I loved the stuff. It made it so shiny! And we can't forget the losers right?? We also made "the loser" a trophy. He was super easy to make too. They named him "The Tebow Toilet Bowl." No offense to Tebow fans out there! It just rhymed and sounded funny. Plus it's my husband's best friend's favorite player and they love teasing him about it. 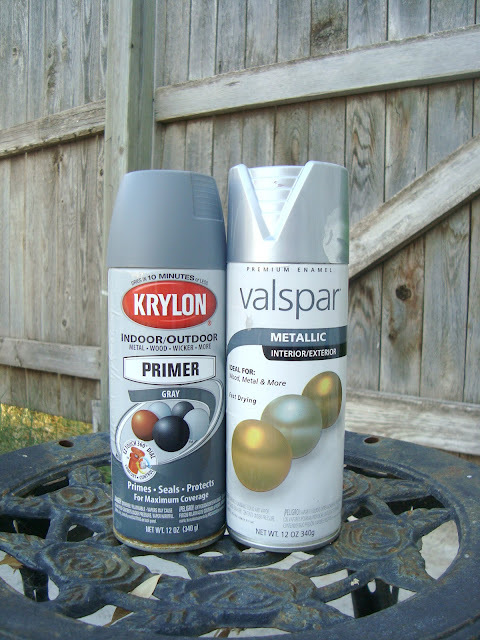 To make this guy, I just spray painted another figure my husband didn't care about "messing up". And I found an empty oatmeal cantainer for the base. 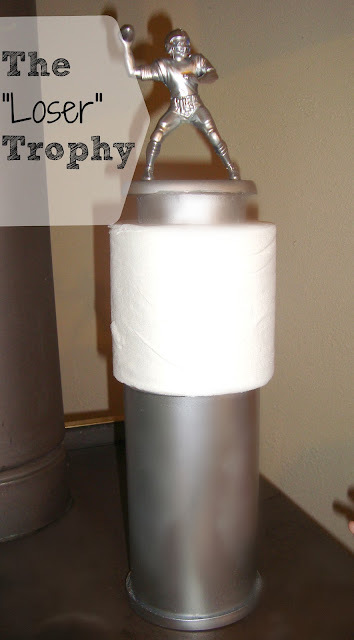 I painted it chrome, put a styrofoam block inside, stuck a wooden dowel in the center for the toilet paper to sit on. I then glued the figure to the top. They had a lot of fun passing around the trophies and taking pictures with them. And of course there was the trash talk about who is going to be taking that trophy home this year. It was a super fun and easy project that we enjoyed doing a lot. So is any of your husband's like mine and have boxes of toys collectible figures at home? My husband has so many sports figures its crazy! The rules are posted in my blog!